First, I did the GRID technique with the SCOR-PAL. But if you do not have a SCOR-PAL you can use a bone folder and a ruler or a paper trimmer...whatever you have will work! I stamped the Bella Toile BG (by SU) in Brilliance Black ink and colored it in with my favorite makers - the COPICS! 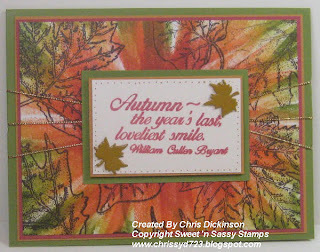 Then I stamped the THANKSGIVING BLESSINGS stamp set from Sweet 'n Sassy Stamps - this is a NEW RELEASE as of September 1! Thank you for looking! Have a fabulous and SAFE weekend! 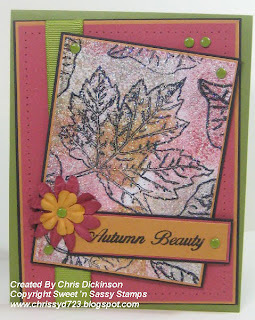 Todays card showcases the stamp set AUTUMN BLESSINGS, that I drew! It will be released Monday, September 1! I used the Bouncing Brayer technique. Click HERE for the tutorial. I saw a card last year with this technique and absolutely LOVED it, but was intimidated to actually TRY the technique. LOL I will ASSURE you that there was absolutely NO NEED to be intimidated. An Ink Pad - Spectrum pads work great, but if you do not have one - make your own with a diaper white and ink refills! Can you do all of those things? Okay! Then make a card, upload it and share the link here! I would LOVE to see your creations too! If you are stopping by to look at this earlier than Sunday night - be sure to check out more BLOG HOPPING. You can view the information on the side bar to the RIGHT! Thank you for stopping by! Have a safe and joyful weekend!!! 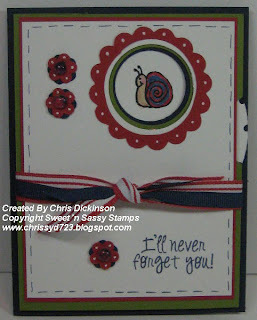 If you are new here...This week the Sweet 'n Sassy Stamps we are having a BLOG HOP. Today the Featured Artists are Michele & Sandy. Be sure to check them out. If you have not seen ALL of the FABULOUS entries be sure to check out the Design Teams work and the Sweet 'n Sassy Blog this is where it all ends on Sunday, 08-31. Do not forget about the Sunday Release Party! The Sweet 'n Sassy Release Party will be held at our new forum site. You'll want to head over there soon to register so you don't miss any of the fun! The RP will kick off at 9pm EST and go until midnight when the new sets are released. There will be plenty of surprises, chatting (of course) and challenges (with prizes) from the DT, so again, you DON'T WANT TO MISS THIS!! Now about my card, do you see the SHIMMER? I tried a new technique tonight, but I didn't have all of the correct tools, so I substituted them. I think if I had the correct supplies it would have turned out even BETTER! My friend Joy came over today and asked if she could take my Craft Ink Refills, and since I am camping this weekend, I said TAKE THE WHOLE BOX! But after she showed me her card that she wanted to make, I had to TRY one too! Here is what you do to get this shimmery effect..
1. Stamp your image in STAZ ON ink - on GLOSSY cardstock. 4. 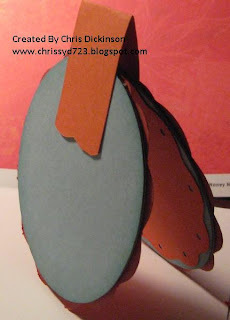 Place your Glossy stamped cardstock face down into the plastic/ wax paper and smoosh the color on to the cardstock. 5. Take off and Sprinkle Iridescent Ice Embossing Powder over the wet ink. 6. Using your heat tool, emboss the entire image. 7. Waaahhh-La! Finish your card! It ends up being soooo shimmery and gorgeous! I love it. Now maybe there is a Technique name for this, but I am sorry I do not know it. This week we are having a BLOG HOP - so be sure to check out Christi & Faith's Blogs today (Friday 08/29) to see what other SNEAK PEEKs there are from the upcoming Release on September 1. For more details check out the side bar on the RIGHT! 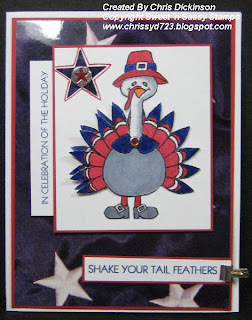 This week's Bloggers Challenge is to make a Patriotic card OR a BABY card. I actually need to make a baby card too, but time got away from me. 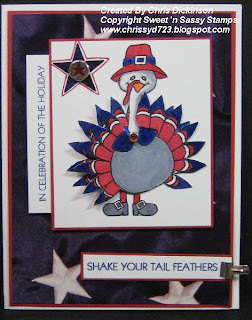 This ADORABLE stamp set is one of Sweet 'n Sassy's upcoming releases titled TURKEY DAY! These words are NOT in the stamp set! I typed these up on my computer to make this card! 1. First, I stamped TWO turkeys in black ink. 3. Be sure to cut around each feather, the collar and the body. That is what should be remaining on one of your pieces. 6. I punched a half inch circle and added that to the neckline of the turkey body. I used Red Sticky Tape and left half of the circle above the cut out area. 6. Color what is remaining to blend in with the collar and neck of the turkey because you will see a portion of this support circle. 7. Using an eyelet hole punch (*gasp! * I still have this! LOL I had it tucked in a deep, dark corner and had to dig it out since my Cropodile would not reach) to punch a hole in the collar area for the brad. 8. 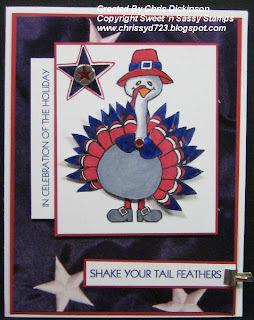 You now have a turkey that can shake his tail feathers! Ink: Black Brilliance Ink - colored with Copics. I did not have a blue dark enough to match the paper, so I shaded the feathers with a Prismacolor pencil to get the darkness I wanted to match the Navy in the photograph. So what do you think? I appreciate your comments! Do not forget to check out the other Bloggers Challenge participants AND the BLOG HOP for Sweet 'n Sassy Stamps! The Blog Hop will go through Sunday, 08/31! THANK YOU for stopping by and taking a look! Today is DAY TWO of Sweet 'n Sassy's BLOG HOP and it is MY day and the very talented Jen Ofiana's day. So when you are done peeking at this, be sure to HOP on over to Jen's Blog! This card showcases the stamp set Autumn Blessings that will be released September 1! I stamped the berry branch twice - with Brilliance ink and colored them in with my Copics. One of the branches I cut out with my trusty ole Paper Snips and then popped up with my Dimensionals. I cuddlebugged the Barely Banana with the Houndstooth die and the Swiss dots on the Real Red cardstock. I keep forgetting I have the Cuddlebug. I can not WAIT to get the Nestibilities! I love how that embosses the shapes! I also want some of the SU Big Shot dies...but need to wait for now. I used my Old Olive marker to fill in some of the lines and then put small dots of red using my Real Red marker - just to liven this card up a bit. Do not forget to HOP on over to Jenn's blog! Thank you so much for stopping by! I would love to know what you think! Have a great day! This Weeks Belli Challenge is BAUBLES AND BLING!! You can embellish anything with your BAUBLES or BLING. I used a little hardware for my challenge! Here is what you need to do...Make a completed project embellishing your work with ANY type of BAUBLES, DEW DROPS, BLING, or if you have a piece of hardware laying around...use that! Share the link here in the comments linking to my Blog and CBC31. 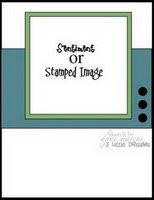 When you post to Splitcoaststampers or to your Blog, be sure and put CBC31 as the KEYWORD and mention of the challenge - with a link!I will do a random drawing for all participants and have a special pack of assorted Designer Papers for the winner! 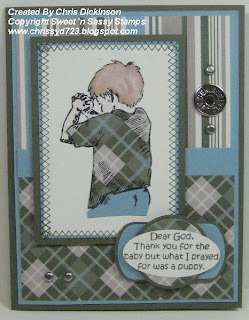 This week in celebration of my stamp sets being released the BELLI Team is using my stamp set Child of God! This is not the Belli Challenge though. :) You can order your stamp as of September 1. 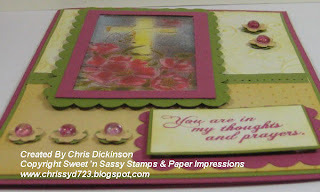 Stamp Set: Child of God bt Sweet 'n Sassy Stamps, All in a Row Stampin' Up! Scroll down when you are done reading this! There will be TWO POSTS today! Thank you for stopping by! Be sure to upload and share your Art with us! We love to see it! Have a fabulous day! Hello Friends! It is HERE! 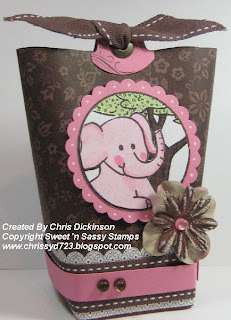 The preview to all of the wonderful NEW stamp sets Korin from Sweet 'n Sassy Stamps has for you! So for starters check out Sweet 'n Sassy's Blog then head on over to Jessica and Faith's blog! Be sure to leave everyone a comment and tell them what you think! Your comments make our day! Have fun and be sure to check back tomorrow for more releases!!! A True Friend - Plus a color challenge! 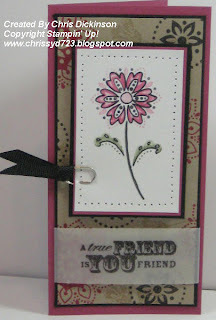 Today is Color challenge day over on Splitcoast Stampers and the challenge was to use Rose Red, Basic Black and KRAFT cardstock. If you do not have Kraft cardstock you can use Creamy Caramel, but it doesn't quite pack the same punch as the Kraft does! Courtney from 3 Little Dreams DT, which I am sad to say is no longer due to uncontrollable circumstances, recently started her own challenges on Tuesday! So to support the 3 Little Design Team, I thought it would be fun to participate in an unofficial sort of way to support them! This week, the challenge is to make a 3x6 card. 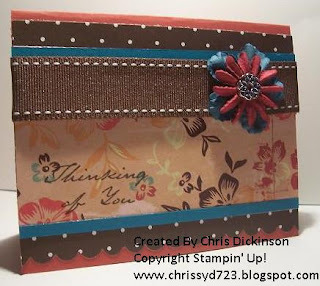 Now this card uses Stampin' Up! only. 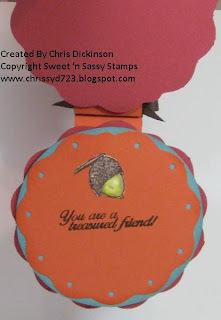 I am planning to make another project today using a Sweet 'n Sassy stamp set that I will post here as well. But this card is for those customers and friends are SU only users! When is this you say? The next release will be Sept. 1st (midnight EST) and to celebrate our 7 newest sets we have some exciting events planned! TWO of these 7 are my PERSONAL DESIGNS!!!! Wanna see sneak peeks of ALL our newest releases?? Then you don't want to miss our DT Blog Hop. It's going to take place over the 5 days leading up to our release, August 27th-August 31st), a countdown of sorts. You'll start on the SNSS blog and from here you'll head to each DT members' blogs to see what wonderful things they've made with our newest stamp sets. Korin will post the "schedule" for you soon. It will also be posted on the DT sites for the duration of the Blog Hop just in case you missed a day (we wouldn't want that!). Here are the places to HOP to STOP and check out some SNEAK PEEKS! We'll end the Blog Hop back here on the SNSS blog just in time for our first ever release party!!!! Our Release Party will be held at our new forum site. You'll want to head over there soon to register so you don't miss any of the fun! The RP will kick off at 9pm EST and go until midnight when the new sets are released. There will be plenty of surprises, chatting (of course) and challenges (with prizes) from the DT, so again, you DON'T WANT TO MISS THIS!! Korin could have stopped at the RP but she just couldn't resist :). On September 1st, Korin will be giving away an entire collection of our September release, that's 7 sets, a value of $135!!! How cool is that?! Keep an eye out for more details as we get closer! Have a great day! ELLIE - IT'S IN THE BAG! A few weeks ago, a group of my friends started making these adorable bags! Of course, I had to jump on the band wagon and make one too. You can view the directions on Cambria Turnbow's Blog. I paper pieced Ellie and the tree trunk. The leaves, I colored and doodled in with the Garden Green markers. The directions I was failoed to follow were to use a Sweet 'n Sassy Stamp set or a Bella Stamp set. At the moment of making this card, I wasn't thinking of that, I had just grabbed this card. I stamped the image on Watercolor paper - but I got a little carried away with squeezing my Aquapainter and over saturated the paper by the butterfly and the bird - so there is a little area with "water spots." I used Watercolor Crayons and Twinkling H20's to color this too. I am working on designing a stamp set right now and have a bit of a headache. 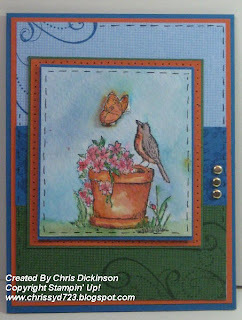 For this card, I used the Canvas BG and the Bella Toile BG stamps by SU along with the Serene Spring. Cardstock and ink colors are Garden Green, Pumpkin Pie, Pacific Point, Watercolor Paper, Bashful Blue. I paper pierced around the edges then felt it needed a bit something else, so drew FAUX stitching around the borders of the cardstock. Thank you so much for swinging by and looking at my work! Have a great day! Beate's back with another challenge! We are her Weekend Sketch Challenge #54. Thank you for stopping by and looking! Have a great day! Taylored Expressions has a weekly challenge and this weeks challenge was this sketch! Thank you so much for looking! Be sure to sign up for my BLOG CANDY!!! Stop again tomorrow to the BLOGGERS CHALLENGE!!! Have a fabulous day! BELLI CHALLENGE #30 - COASTERS with SNEAK PEEK! What is the Belli Challenge you ask? Each week, I try to give us a challenge that will use things we have lying around our stamp rooms! With a constant flow of new things coming out, I tend to forget about the other things I have and they quickly become clutter! This Weeks Belli Challenge is COASTERS!! You can make, embellish or design MANY different things with your COASTERS. You can use the chipboard coasters, you know the ones many restaurants have...Here are some ideas.... Post-it note holder, cards, boxes, the list goes on and on!!! ANY other ideas? 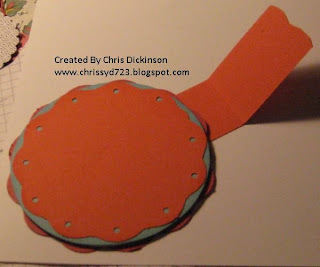 Here is what you need to do...Make a completed project using anything with a COASTER and share the link here in the comments linking to my Blog and CBC30. When you post to Splitcoaststampers or to your Blog, be sure and put CBC30 as the KEYWORD and mention of the challenge - with a link!I will do a random drawing for all participants and we will feature that persons art work on my Blog AND they can pick a week to be a Guest Designer for the Belli Challenge! This week's winner is JOAN ERVIN! Click on her name to check out her fabulous gallery. I was at my girlfriend's house this weekend as you know and I had SQUARE COASTERS at home...but she had round ones, so I thought it would be FUN to make a ROUND card. I used my Coluzzle and cut the largest circle I could in the Riding Hood Red cardstock. I used her large Corner Rounder to make the larger scallops. 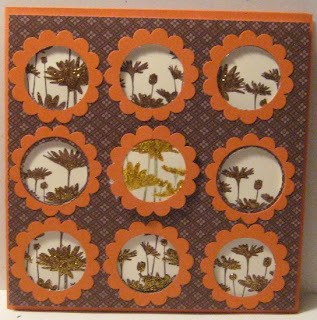 There was no circle size for the chipboard, so I just traced it and cut around the Baja Breeze Cardstock, then used the Coluzzle for consecutive layer of Tangerine Tango. I designed a "FLAP" and used RED STICKY TAPE to attach it on both circles. I attached it UNDER the layers so they will not show on either peice of cardstock. 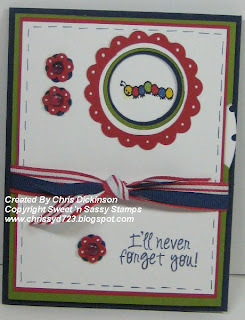 I used the 1/8th circle punch to add a little more detail to the card and sponged the edges with the same color. ONE AND ONLY SNEAK PEEK before the Blog Hop! So be sure to keep an eye out for more information as we get closer to the RELEASE PARTY! I am preparing for BACK TO SCHOOL this week. I can not believe the summer is only one week away from being over! My teen ager daughter, who has been gone the past 2 months comes home from her trip next weekend, so this week will be preparing for that, as well as preparing for my Customer Appreciation Day on Saturday! I will use this box as one of my door prizes and throw in a stamp and an ink spot! Todays Splitcoast Technique Lovers Challenge is to make an ACETATE BOX! You can view the instructions there as well. 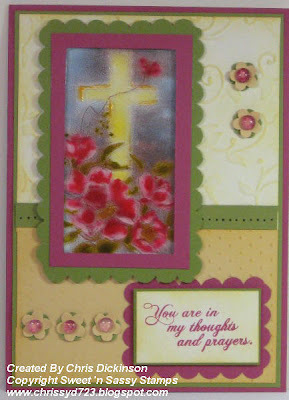 I used the new BELLA ROSE cardstock, along with some window sheets (acetate). I had some Kiwi Ribbon laying around from the dollar basket at the local scrapbook store. The PRIMA flowers are from the Stone Rose collection. I threw a golden FIRE Circle Rhinestone Brad is from Stampin' Up! I used a Glue Dot to hold the flowers in place. I hope you all are having a WONDERFUL weekend!!!! God Bless You! 1. 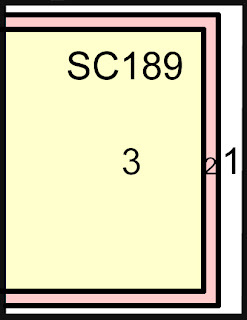 The surface area to cover on the glass block measures 3 3/4" square. Stamp and color your image. Cut the piece of cardstock 3 3/4" square (if you want to layer then cut pieces accordingly.) Repeat directions for an image on the reverse side. 2. Place the cardstock pieces face down on the cold laminate film. Press to remove any air bubbles.Trim the pieces closely along the outer edges. 3. Peel off the backing paper from one side of the double mounted adhesive tape sheet. Press it to the backside of the trimmed cardstock piece. Trim along the outer edges again. Repeat with other piece for back. 4. Make sure your glass block is wiped clean and free of finger prints. Lay the glass block flat on your work surface with the opening point toward you. Peel off the second adhesive backing from one of the pieces and position it carefully over the center of the glass block. Please do this SLOWLY - once your tape adheres, it is stuck for good! Press the piece down, espcially along the edges. 5. Turn the glass block over and repeat with the second piece. 6. 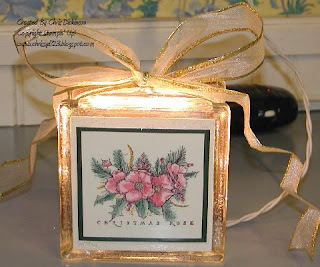 Take the string of lights and feed it into the opening of the glass block. Place the last bulb inside and secure a piece of the cord with a dollop of industrial glue near the opening of the glass block. (optional) Let dry thoroughly. 7. Use a 2" wide strip of ribbon to cover the sides of the light. Wrap the strip completely around the sides of the glass block and tie a bow on the top. Add any other decorations if you wish. 8. 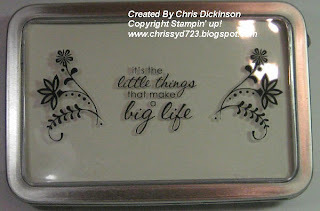 Paint Sparkle Modgepodge on the glass borders to create a glittery frame. If people are interested, I can get more glass blocks FOR SALE - Contact me at adickinson@wi.rr.com and I can give you more details. these glass blocks have the holes pre-cut inside of it, so no drilling is necessary! Bloggers Challenge #60 - BIRTHDAY CARDS! I am not sure how much blogging I will be getting done this weekend. 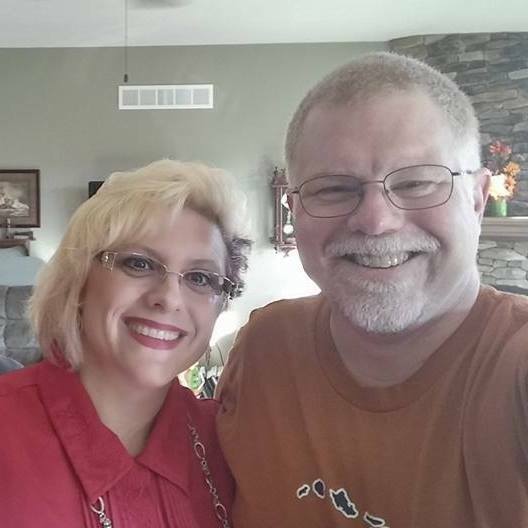 I am getting together with my good friend Danita in Illinois. We met in a stamping group on line and have gotten together several times. We always laugh so much when we are together, so I am sure my cheeks will hurt by the time our time together is through. Anyways, for this weeks challenge I made a VIEW MASTER CARD. You can view the directions HERE. 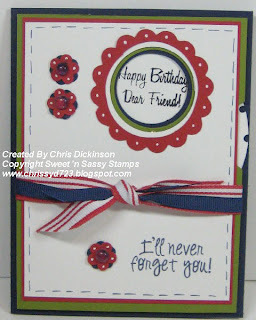 For my card, I used the ELLY AND FRIENDS stamp set from Sweet 'n Sassy Stamps. Thank you so much for stopping by and looking! Have a fabulous weekend! Come join us in the Belli Challenge and be sure to post your link to this website! This Weeks Belli Challenge is ANYTHING with SCALLOPS!! You can make Embellish or design MANY different things with any SCALLOP in your project. If you do not have a scallop punch, use a corner rounder to make a scalloped edge, scallop scissors, a scalloped stamp set, DRAW a doodle of scallops around an image, use ANY scallop punch... ANY other ideas? Make a completed project using anything SCALLOP RELATED item and share the link here in the comments linking to my Blog and CBC29. When you post to Splitcoaststampers or to your Blog, be sure and put CBC29 as the KEYWORD and mention of the challenge - with a link! I will do a random drawing for all participants and we will feature that persons art work on my Blog AND they can pick a week to be a Guest Designer for the Belli Challenge! I decided to have TWO Guest Designers on different weeks - Liz Miller and Karen Foltz. You can view their creations by clicking on their names. They both do beautiful work!!! Technique: Stained Glass - I made this for Monday's Splitcoast Stampers Technique Challenge Stained Glass. 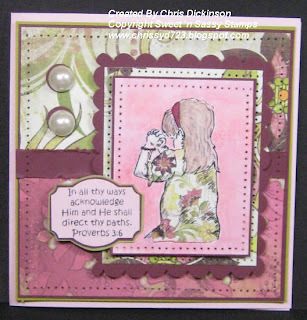 Today is Sketch Challenge day on Splitcoast Stampers 189. 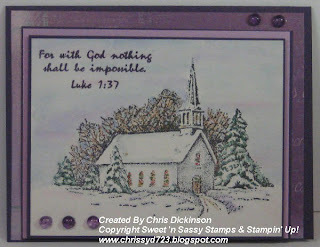 I have so many scraps laying around, I grabbed this stamped image of Silent Night stamp set and watercolored it. I wanted a sunset scene, so I used Bashful Blue, Perfect plum, Pretty In Pink and Lavender Lace for the ink. The church building I watercolored using Bordering Blue for the shadows and then made little stained glass window using More Mustard, Garden green and Ruby Red. The trees I watercolored using Handsome Hunter. Cardstock and Ink: (see above for ink colors) Black Staz On, Elegant Eggplant, Pale Plum, Shimmery White, Dp is from the Paper COmpany- Snowflake Sentiments. This is also very shimmery, but the photograph does not pick this up! 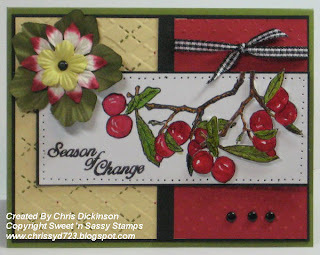 Today is Color Challenge day on Splitcoast Stampers. The Color Challenge #179 are Taken With Teal, ELegant Eggplant and Old Olive. I really like the Rich, Bold colors together! 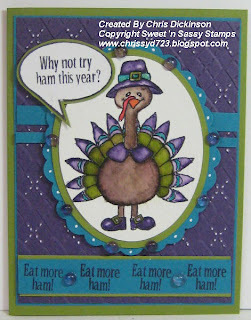 I used Turkey Day from Sweet 'n Sassy Stamps for this card. This stamp set is so FUN to play with. It will be released September 1! Sooo this is a SNEAK PEAK for you in two ways! One for the Turkey Day set and also for tomorrows Belli Challenge. SOMETHING on this card is part of tomorrows Belli Challenge. Here are the details for the card! Thank you for stopping by! Your comments make me smile! Have a great day! 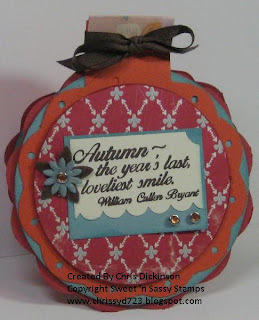 Today is Featured Stamper Day on Splitcoast Stampers and the Featured Stamper is Blondie090277. You can view her gallery here. With the Featured Stamper Challenge, we are supposed to take a card of your choice and copy it, but change a few things. Here is the card I chose to copy and change. 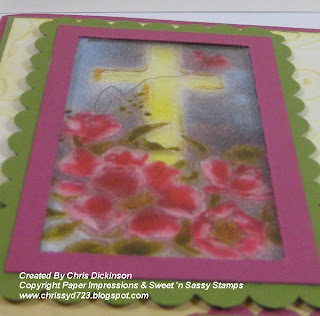 I used the Stamp set I designed, called Child of God. 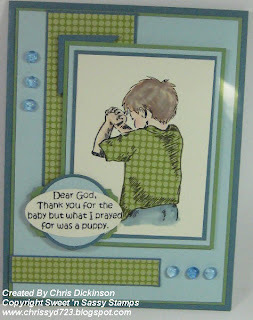 It will be available September 1 through Sweet 'n Sassy Stamps. Thank you for looking! Have a great night! The one we were watching closely died. The fifth cocoon still has not hatched. I am watching it daily, but no changes and I am wondering if that one has died too, although it is still in the net. As we were setting it, one butterfly landed on Noah's leg, but I caught the picture as the butterfly went to the ground. I am not much of a gardener - but if you look closely in the dirt the butterfly is there, closed in one image. The other has his wings open. Unless that other cocoon/ butterfly comes out. This will be it for this particular Science project! I will post different projects as we do them. Thank you for tuning in to see the changes! I am glad you enjoyed them. This entry offers you several sneak peaks into some new Sweet 'n Sassy stamps that will be revealed on September 1. 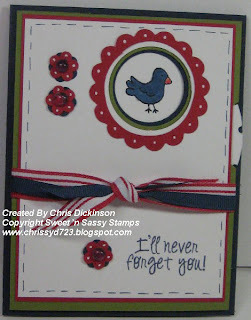 This weeks Bloggers Challenge is to make cards that are the SAME but DIFFERENT. Different colors and different stamps. I enjoyed this challenge, so I made three cards! This first card I used 2 new stamps! 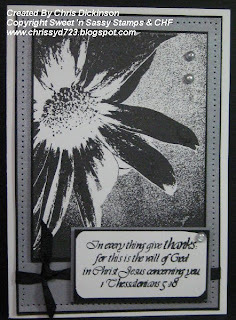 One was the Shady Daisy background - that I LOVE, my hubby said he thought it was a XEROX. 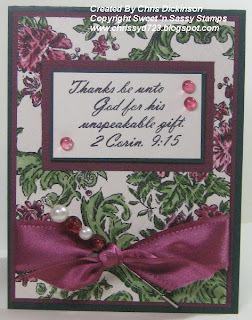 LOL It also showcases the NEW Thanksgiving Scripture set from Sweet 'n Sassy Stamps. 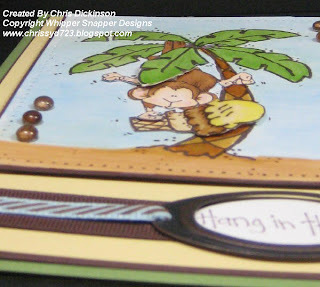 Stamp Sets: Whipper Snapper Designs - Swing Monkey, ICe cream cone and words. 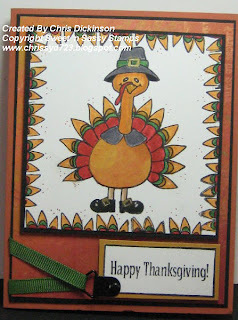 This card features a NEW stamp set that will be released September 1 from Sweet 'n Sassy Stamps called Turkey Day. I love this little turkey!!!! He is soo cute. I colored the ribbon with a Copic marker and attached it using a Black hardware piece. There is a fabulous frame that comes in the set to frame your words and I used that around the Happy Thanksgiving text. Thank you for stopping by! Be sure to check out the other Bloggers Challenge cards! Have a great night!!! These stamps are from a non-smoking home! I accept Paypal, Cash, Check or Money Order. These prices do not include shipping. I will ship Priority Mail and will figure out postage when you confirm a stamp set for purchase along with sending your zip code. Cricut - cuts sizes; ranging from 1" to 5-1/2". Phrases and borders can be up to 11.5" long! I have used this about 15 times. It is is in EXCELLENT condition. Asking: $100.00 or Best Offer! I will be adding more over the next few weeks! Be on the look out! BELLI CHALLENGE #28 CONTAIN IT! 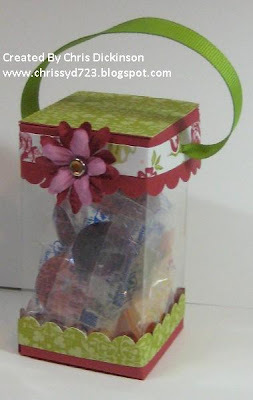 Make a completed project using anything CONTAINER RELATED item and share the link here in the comments linking to my Blog and CBC28. When you post to Splitcoaststampers or to your Blog, be sure and put CBC28 as the KEYWORD and mention of the challenge - with a link! 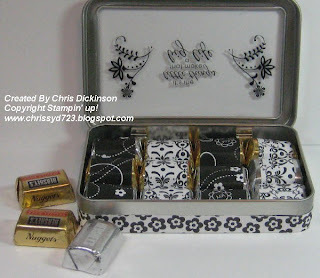 Tin ...oh and don't forget the chocolate!!! Isn't this bunny soooo cute? 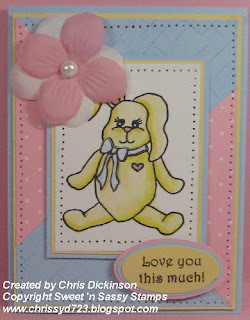 As of September 1, Sweet 'n Sassy Stamps will be featuring this stamp set - HUGS FOR JANESSA. $5.00 of the proceeds will be given to to a family who is dealing with Luekemia, currently Janessa, korin's neice, to help cover medical expenses. Once Korin's neice is in remission, the portion will go to another family with Luekemia. 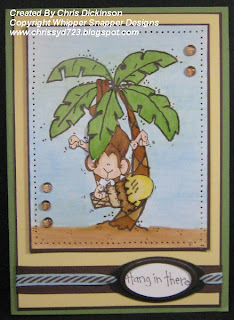 Korin at Sweet 'n Sassy Stamps is sponsoring the Dutch Dare Card Challenge this week. WHich means for you that you can win a FREE stamp set!!! Check out the Dutch Dare Card Challenge and participate by Wednesday! You can win the Elly & Friends stamp set which is a $25- value! Thank you for looking! Don't forget to scroll down and check out the Blog Candy!!! Have a fabulous day! I made this last night, but with Blogger difficulties and being gone all day, I did not get to post it until now. I used the GRID Technique over at Splitcoast...TLC177. SNEAK PEAK into MY personal Stamp Set!!!! !